Thousands of free Kindle books are out there. You just have to know where to look. When you own an Amazon Kindle, the cost of supporting a voracious reading habit can get very steep, very quickly. A quick glance at Amazon’s list of the Best Books of the Month shows that a decent read can set you back between $13 and $15 for a Kindle edition book. Sure, Amazon offers deals on great e-books, but waiting for a deal could take forever. Many titles can be had for two bucks or less, but it takes work to find the gems among the dross. At last count, Project Gutenberg offered 57,245 free ebooks that can be downloaded in a number of formats, including ones that are readable on a Kindle E-Reader. 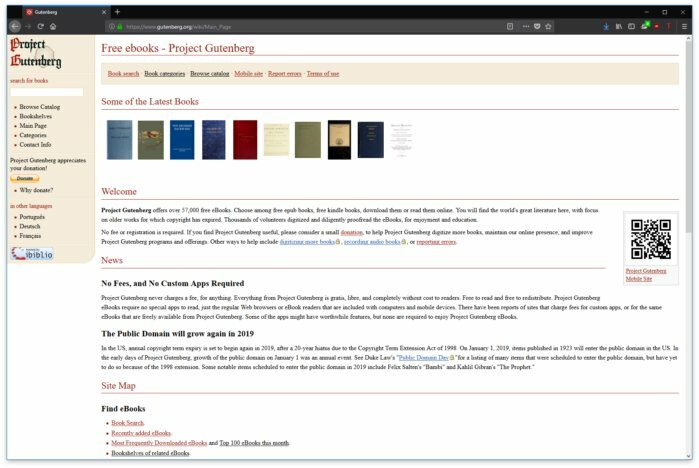 You won’t find any new releases here, with good reason: All of the titles available though Project Gutenberg are either in the public domain, because the copyright on the work has expired or because the holder of the book’s copyright has given the project’s organizers permission to provide access to it at no cost. To get Project Gutenberg books onto your Kindle, download the book you want to read. Then, attached your e-reader to your PC with a USB cable and open it in File Explorer, just as you would any other connected drive. In your Kindle’s file directory, you’ll see two file folders: Documents and Fonts (if you own a Kindle Oasis, there will also be a third folder, called Audible.) Drag and drop the .mobi file you downloaded from the Project Gutenberg website into your Kindle’s Document file and disconnect the device once the file transfer is complete. Boom: You’re ready to start reading. One word of caution: If you live outside of the United States, downloading the books from Project Gutenberg might not be legal. Be sure to check your local laws before pulling the trigger on any books you find here. With OverDrive, your local library becomes your Kindle’s best friend. If you’ve got a library card, you’ve got access to free e-books. 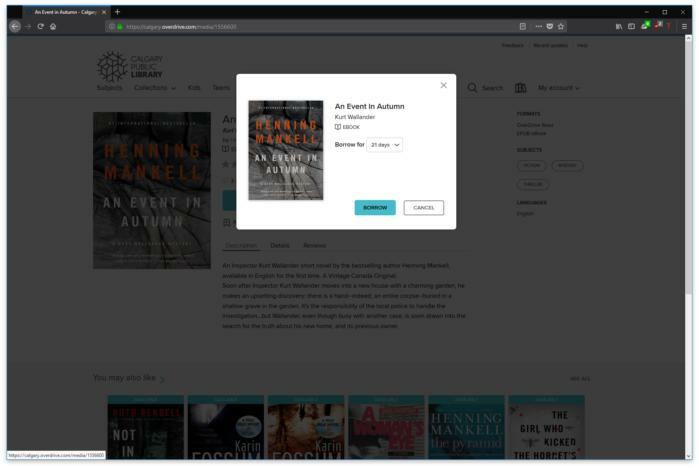 OverDrive is an online service that allows library card holders to download free e-books (and movies and audio content, too) from their public library, school or institution’s collection to their Kindles. The more library cards you have in your name, the more books you have access to. Using OverDrive is dead simple. After entering your library card number and the PIN assigned to you when you were issued your card (if you can’t remember it, ask your librarian,) you’ll have access to all of the digital content that your library has in its collection. The more libraries you belong to, the better chance there is of finding something you’ll want to read. Just like a brick-and-mortar library with actual books on its shelves, only one person can take out a book on OverDrive at a time. If a book is available, click Borrow and follow the prompts.The service also provides a well-written help section to walk you through the process. Depending on your library's rules, you may be able to choose from a number of loan periods. If a book’s unavailable, many libraries will allow you to join a waiting list. When your turn comes around, OverDrive will let you know. That’s the good stuff. Now for the bad: Not all libraries offer Kindle-ready editions of the e-books that they have in their collection. Many libraries serve up digital content as an Adobe Digital Editions file—a format that’s not compatible with Amazon’s E-Ink devices. Amazon doesn’t advertise the fact that you can loan books to friends, but the option is there and it’s fabulous. While Amazon keeps it quiet, some e-books purchased via the Kindle Store can be loaned out to your friends. Just hope that they’ll return the favor from time to time! 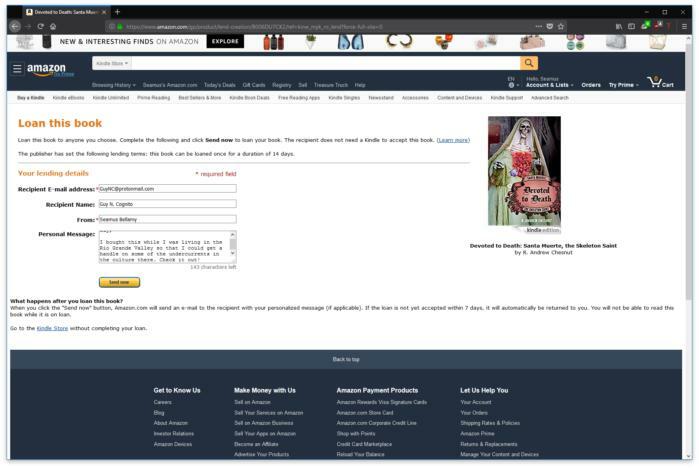 To loan out a Kindle e-book, sign into Amazon.com and open the Account & Lists drop down menu, located in the top right corner of the Amazon homepage. Choose Your Content & Devices. You should see a list of all of the Kindle e-books you’ve ever bought. Next to the title of each book, you’ll note a grey square with three dots on it. Click it, and a list of all of the options for this title will appear. If Loan this title is on the list, you’re in business. Clicking it will take you to a page that lets you send the book to the friend of your choosing’s email address. Your Kindle e-books can be lent out for a 14-day period, during which time you won’t have access to the title, yourself—just as if you’d lent a book to a pal from the shelf in your living room. Amazon allows two adults in the same family to share the books they buy with one another. If you’re not the only Kindle owner in your family, you’re in luck: Amazon will allow a maximum of two adults per family, to share Kindle eBooks with one another. So, if your partner buys an e-book from the Kindle Store, you’ll be able to read it too, at no charge. 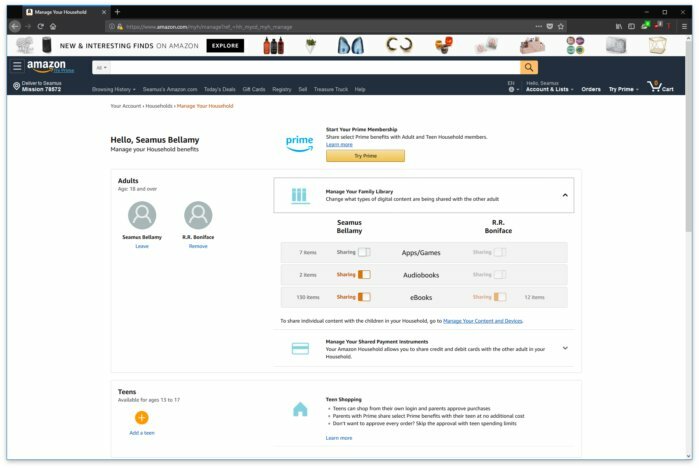 To get started, log into Amazon’s website and go to your Account Settings > Your Content & Devices. Click Households and Family Library. From here, you’ll be able to set up your Family library sharing settings.